Whale songs are some of the most distinctive -- and beautiful -- noises of the animal kingdom. But you may not realize that they differ from species to species in dramatic ways. 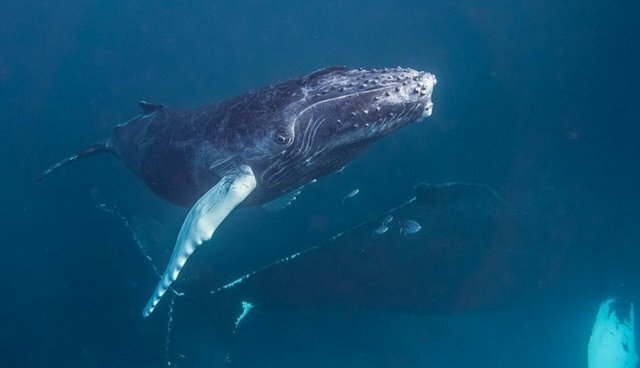 Here are some of the most iconic, spectacular whale calls on Earth. Note: Some of these calls are sped up to make them audible to humans. The blue whale is a notorious ocean singer, famous for their long calls that can last up to two minutes each. This call, captured by Ocean Networks Canada, is just a taste of the blue whale's famous song. Minkes may have one of the most distinct vocalizations of all the whales. Often called a "duck-like" sound, researchers had been puzzled by the source of a strange "oceanic quack" they'd been hearing for over 50 years in the Southern Ocean. Turns out, it was the minke whale all along, though they also make other vocalizations as well. Known for their characteristic patterned sequences of short beats, fin whales are the timekeepers of cetaceans. The second largest animal on Earth, the fin whale's calls are at a very low frequency, below the range of human hearing. This audio, recorded by Ocean Networks Canada, was sped up by a factor of 10 to make it audible. Gray whales are not well known for their vocalizations, which have rarely been recorded and sound more like grunts than much else. But researchers did manage to capture a few of these bizarre noises. Sperm whales, like orcas, use clicks to echolocate and get an idea of their surroundings. They also use distinctive creaks -- rapid series' of high-frequency clicks that sound like a creaky door hinge. A diver off the coast of Dominica captured one such creak from a juvenile sperm whale.